The worst part about the first 2 years of medical school is that most of your time is spent studying alone. Despite the fun pictures on Facebook, we don’t actually get to hang out together that much. To try to remedy this situation, John and I decided to have a little “Lasagna Party”. It was a good excuse to get together with all of our friends, including the newest “member”- Baby Zoe! We have some diverse tastes in our group, so we had quite a lasagna selection: Spinach Lasagna, Lasagna with a a beef and sausage sauce, and Lasagna made with chicken sausage. It was quite a feast! Of all the lasagna choices, this spinach lasagna was probably the healthiest. (Not quite sure I can call it healthy – it’s still lasagna after all). But in general, the cream sauce used in spinach lasagna usually makes it much more fat and calorie laden than it’s meat and tomato counterpart. However, I found a recipe that didn’t use cream, and used non-fat ricotta, to make this a healthier and much reduced fat version. At first I was skeptical that this lasagna would just taste like a lowfat version of the real thing, but I was very pleasantly surprised. I don’t think anyone would’ve guessed that this was “reduced fat”, and it was really quite easy to put together (it does take some time though). – Makes a 13 x9 dish to feed 8-10 people. 1. Heat a large pot of water over high heat. Season with salt and olive oil. Add lasagna noodles to water and cook for about 9 minutes. (It’s better to undercook the noodles slightly.). Drain, and lay noodles onto paper towels to dry separately. 2. Combine ricotta cheese, 1 1/2 cups mozzarella, 1/2 cup parmesan, slightly beaten egg and salt and pepper in a bowl. Stir to combine, then set aside or refrigerate for later assembly. 4. Slowly whisk in all 5 cups of milk and 2 bay leaves. Simmer, while stirring occasionally, for 10 minutes. The sauce should thicken slightly. 5. Remove from heat, and remove bay leaves. 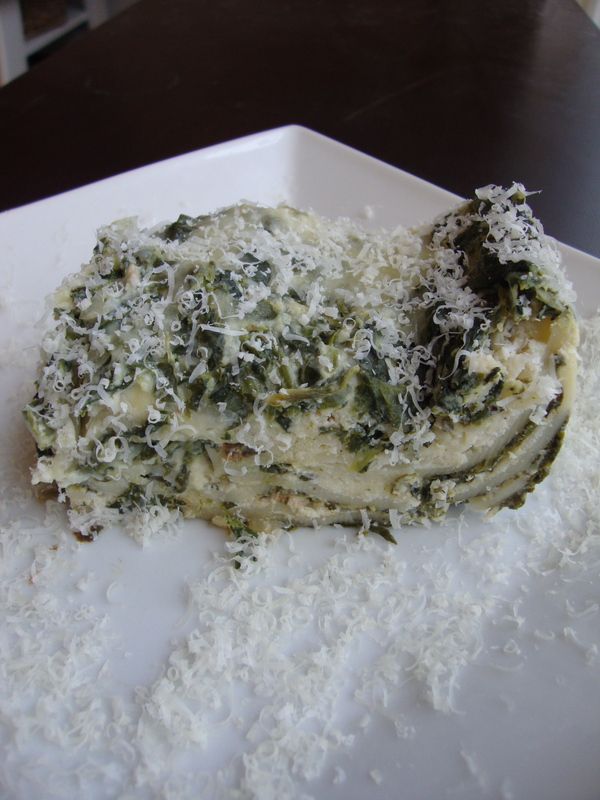 Stir in spinach, nutmeg, and remaining (1/2 cup) parmesan. Season with salt and pepper. 6. Preheat oven to 375 degrees. Coat a 13×9 inch pan with cooking spray. 7. To assemble: Place a heaping cup of spinach sauce on the botton of the 13×9 inch pan. Layer 4 noodles, overlapping, on the bottom of the pan. Spread about 1 cup of ricotta mixture over the noodles. Top with a heaping cup of spinach sauce. Repeat 2 more times, ending with ricotta and spinach sauce. The top layer should have 2-3 cups of spinach sauce poured over top. Top with remaining 1 cup of mozzarella cheese. 8. Cover with foil and bake for 40 minutes. To avoid spills you can place the lasagna dish on a large baking sheet lined with foil (I didn’t do this because I didn’t have space in the oven). After 40 minutes, remove foil and continue to bake for 20 minutes. Cool slightly before serving. Recipe adapted from America’a Test Kitchen Healthy Family Cookbook. *In the ATK recipe, they actually suggested making 4 layers of lasagna, using 16 noodles but the same amount of filling. If you really like pasta this might be a good option for you! This entry was posted on February 20, 2011 by Spice Is Nice. It was filed under Main Dish, Vegetarian .